Southeast of the ubosot housing the Emerald Buddha is a tiny chapel built in the nineteenth century to house the Gandharara Buddha image. The bronze standing Buddha has one hand gesturing towards the heavens to call down the rain and the other hand cupped palm upwards to catch the falling water. It was used in the old royal rain-making ritual. Although uncommon in Thailand, the standing Buddha in the position of 'calling down the rain' is quite common in some other countries. The chapel housing the Gandharara Buddha. The chapel is finished in glazed ceramic tiles that were favored in the nineteenth century. 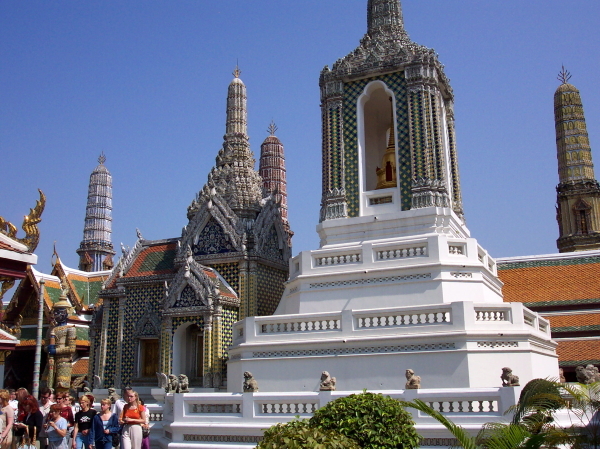 Behind the chapel is a similarly finished tower housing a gilded chedi.